We're not quite into the season of panto and sparkly Christmas shows and as if taking a last breath of seriousness before the season of silliness, the Barbican presents Quartet: A Journey North by Mehr Theatre Company. 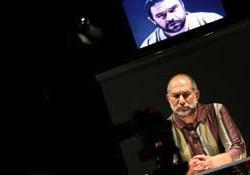 Coming across as a police investigation rather than straightforward five act play, four actors sit back to back under televisions projecting their faces out to the audience. They are playing two murderers and two relatives of the murderers' victims. In no way is this set up going to suit small children shouting 'He's behind you!' And there definitely won't be any sweets thrown to the crowd. Expect a careful, measured exploration of what makes a normal person become a murderer and the consequences of the crime. This documentary theatre piece sounds sombre and solemn; it is also surtitled as it is performed in Persian as part of the Iran: New Voices season, so prepare yourself for something quite special. Quartet: A Journey North, 2 to 6 December at the Barbican (The Pit). For more information and to book tickets, go to the Barbican website.